We have discussed the difficulty of combat outposts in the mountainous Eastern part of Afghanistan, and the tactical problems caused by attempting to defend low terrain. This contributed in no small part to the casualties at Wanat and Kamdesh. A fire fight around Kamdesh typically looked something like this (the scene is of COP Keating from OP Fritschie). The terrain surrounding COP Bari Alai is different. Hostile sniper and automatic weapon fire is a normal part of life here, provided by an enemy who strains to dislodge Afghan National Army and International Security Assistance Forces from the mountaintop in eastern Afghanistan’s Kunar province. For example, in a 74-day period starting in February there were more than 50 recorded attacks against the base, U.S. Army officials said. The Soldiers who live here are well aware of how contested the base is. “If you freeze up in combat, you’re either not ready to be a leader or you aren’t ready for a place like this,” said U.S. Army Spc. Shawn D. Hufford, of Evansville, Ind., the mortar noncommissioned officer attached to 2nd Platoon, Troop C, 3rd Squadron, 61st Cavalry Regiment, Task Force Destroyer. 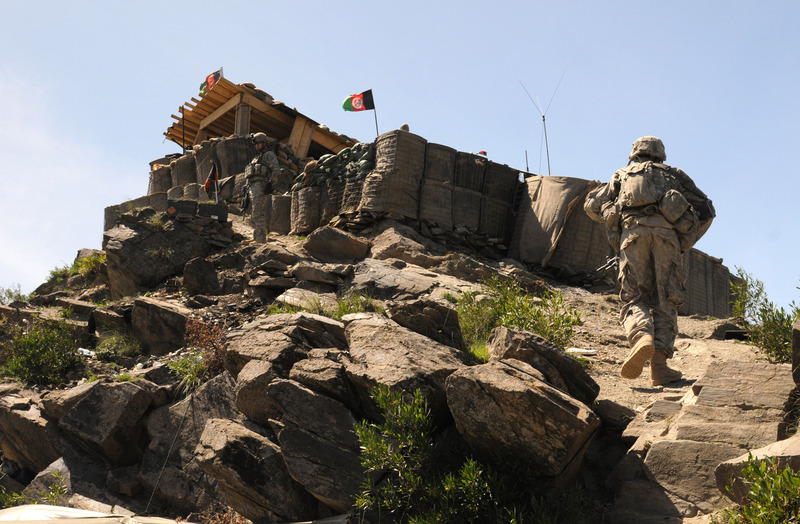 The base was set on its high summit in the Ghazibad district in March 2009 and manned by the Afghan National Army. Officials named it for an ANA Soldier killed earlier that year. It has been almost a year since a subsequent attack killed five Afghan soldiers, five ISAF advisors and a civilian interpreter, causing a fire that levelled much of the post. Despite persistent efforts, the enemy has not been able to duplicate that act since. The base – 3,000 feet above sea level – oversees three valleys and at least ten major villages, providing a vast overlook of the surrounding territory, according to U.S. Army 1st Lt. Richard R. Rowe, 2nd platoon’s leader. This position helps provide protection for neighbouring communities, the nearby district center and Afghanistan National Security Forces – as well as ISAF – as they conduct business with area residents. The relative isolation of the post is an illusion, as ANA Soldiers at the post maintain contact with Afghan National Police who secure the communities below. Although there are taller mountains nearby, the post’s position is high enough to protect the Soldiers and low enough to help protect the community, Rowe said. But recall that this is also the scene, approximately one year ago, of around 100 Taliban fighting uphill towards the COP, resulting in the deaths of three U.S. Soldiers due to collusion between the Taliban and Afghan National Army soldiers. Terrain is important, but it cannot overcome treachery. When possible though, the physical positioning of COP Bari Alai is an example of a wise tactical choice. The quick reaction force called for air support, but the warplanes scanned the area with their targeting pods and reported that the Taliban had collected most of the local civilians and were holding them at gunpoint, as human shields. As the supply went on, they hit two roadside bombs. One vehicle was destroyed, But no one was hurt. Throughout the entire action, no troops (American or Afghan) or civilians were killed. It was the training and leadership of the Afghan troops, and the use of air power (for reconnaissance, not smart bombs) that played a major role in the success of the operation. As is sometimes the case with the Strategy Page, this report also sounds as if it could be an ISAF or U.S. press release by Public Affairs Officers. Whether this report is exaggerated, there is another side to the Afghan Army. We have discussed the drug abuse and addiction in the Afghan Army, and also linked very informative but depressing video of attempts to train the Afghan Army. There is an even more recent report of treachery within the Afghan Army, costing the lives of three American warriors. A pre-dawn attack by the Taliban that killed three American soldiers and six other coalition troops earlier this month is raising new questions about many of the Afghan soldiers who were supposed to be fighting shoulder-to-shoulder with them. Officials are investigating whether the Afghan troops may have colluded with the Taliban in the brazen assault on the remote coalition outpost along the mountainous Afghanistan-Pakistan border. Their findings could complicate further the already difficult challenges U.S. trainers are having with the Afghan Army. American officials have questioned 11 Afghan Army soldiers and one Afghan interpreter who were taken prisoner after the battle and later released. Many U.S. troops in the area suspect that the Afghan POWs may have passively helped their Taliban attackers by laying down their arms, or even actively colluded with the enemy in the attack. Details of the battle have been sketchy, since all three Americans at Observation Post Bari Alai were killed in the fight. Of the four Latvian NATO soldiers who were also defending the post, two were killed and a third was badly wounded and evacuated to Landstuhl Army Medical Center in Germany. According to a U.S. official, the remaining Latvian soldier was “shellshocked” by the attack and has been flown back to Latvia for treatment. Three Afghan National Army troops also were killed. U.S. officials are declining to comment on specifics until their investigation is complete. But conversations with American troops familiar with the situation reveal that in the early morning hours of May 1, more than 100 Taliban fighters launched a coordinated uphill attack on Bari Alai, a tactically critical, fortified mountaintop outpost that overlooks the convergence of the Hel Gal, Durin, Marin, and Kunar River Valleys, as well as a bridge that spans the Kunar River. While Taliban fighters pinned down coalition troops with machine gun fire, their comrades scaled the mountainsides and advanced on the post. Coalition troops killed 19 Taliban fighters, according to U.S. officials. U.S. Army Staff Sgt. William D. Vile, 27, who was wounded, continued to return fire as he called on his radio for reinforcements and artillery support. He was killed by an explosion and has been posthumously recommended for the Silver Star Medal, the Army’s third highest decoration for battlefield valor. The blast breached the perimeter of the post, and the Taliban poured inside. Sgt. James D. Pirtle, 21, and Specialist Ryan C. King, 22, were killed defending the base and were both posthumously awarded the Bronze Star Medal. After overrunning the post, the Taliban fighters captured 11 Afghan soldiers and one Afghan interpreter and transported them into the Hel Gal Valley, where they were held captive. In the days following, U.S., Afghan, and Latvian forces embarked on joint operations to recover the dozen POWs. On May 6, approximately 400 coalition troops made a forceful push toward the Hel Gal Valley, where the POWs were believed to be held. But the mission was halted two hours after it began when the Taliban freed all 12 POWs after coalition forces broadcast radio messages demanding their return. When asked what kind of condition the freed Afghan troops were in, Marine Lt. Col. Ted Adams replied, “Good condition. Too good, actually,” — a sentiment echoed by other officers, which has led many to suspect that the POWs were complicit in the enemy attack. This battle is moderately less costly than the Battle of Wanat (in which nine U.S. soldiers perished and fifteen were wounded), but similar in that it shows both the massing of large numbers of Taliban fighters, and the lack of effectiveness of the Afghan Army. In this battle only three Afghan soldiers perished, and at Wanat, none did. The going forward strategy in Afghanistan seems to be similar to the Iraq strategy in 2004 and 2005 – train the indigenous forces. It didn’t work in Iraq, and Iraq has a much stronger governmental institutional skeleton than does Afghanistan. The U.S. administration is loath to increase troop strength beyond 68,000, but standing up the Afghan Army is bound to be a problematic and troublesome affair. They are not only shot through with corruption and drug abuse, they are apparently guilty of treachery as well. Finally, based on the casualties we have seen at both Wanat and Bari Alai, they simply can’t be trusted in battle.